The K&N 33-2238 fits some Briggs & Stratton 112200, Briggs & Stratton 120800, Briggs & Stratton 121700, Briggs & Stratton 128700-129799 Series, Briggs & Stratton 129800, Briggs & Stratton 12A800, Briggs & Stratton 12E000, Briggs & Stratton 12E700, Briggs & Stratton 12E800, Briggs & Stratton 12F700, Briggs & Stratton 12F800, Briggs & Stratton 12G700, Briggs & Stratton 12G800, Briggs & Stratton 12J800, Briggs & Stratton 12T700, Briggs & Stratton 12T800, Briggs & Stratton 12T899, Briggs & Stratton 135700, Briggs & Stratton 136200, Briggs & Stratton 274474, Briggs & Stratton 80200, Briggs & Stratton 92200, Craftsman Lawn Mower 917378840, Honda All Harmony II, Honda GC135, Honda GC160, Honda GCV135, Honda GCV160, Honda GS190, Honda GSV190, Honda Harmony Late Model, Toro 20323, Toro 20835, Toro 20836, and Toro 29639 models. See vehicle applications for details. The K&N 33-2238 is a synthetic oil-free replacement air filter manufactured to provide exceptional filtration to your small engine or light industrial equipment. This air filter reduces restriction allowing the engine to breathe more efficiently. It is reusable, so it can be washed with K&N synthetic air filter cleaner then reinstalled to use again and again. 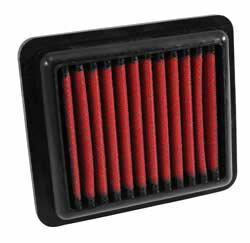 The K&N 33-2238 air filter fits some Craftsman lawnmowers with 6.5 HP engines, some Honda and Briggs & Stratton engines and other small engine applications. Perfect size for my idea... thanks K&N for the great product Include some stickers next time for all the sticker lovers out there Thanks. I love this product, my lawn mower runs smoother. I purchased a K&N 33-2238 Air Filter for my Toro SR4 Super Recycler Mower 21 inch. So I don't have to keep buying paper filters. Wash it let it dry & reinstall. Have K&N Air Filters in everything I own. It's a no brainer better performance and never have to buy a filter again.